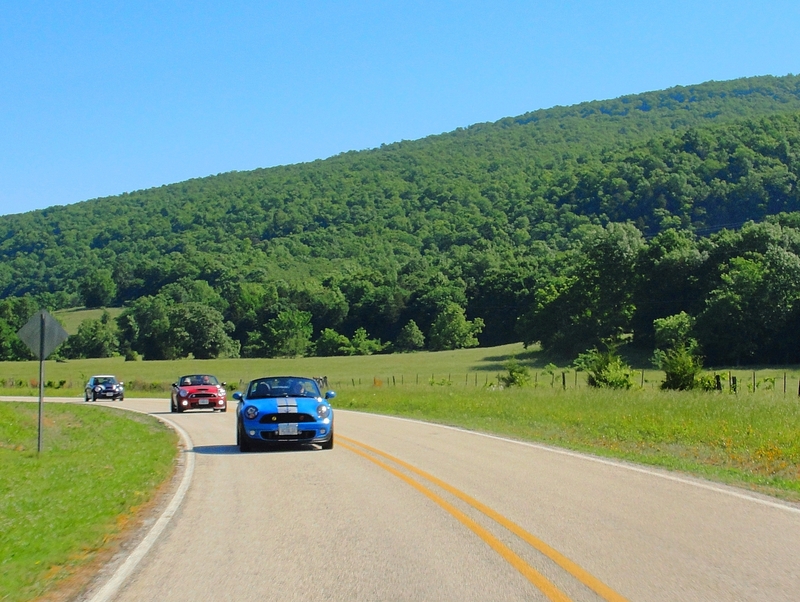 Our annual out-of-area May drive took place last Thursday thru Sunday (May 17-20) and this year’s event took us to the Ozark Mountains of north-central Arkansas. The EIM MINIs in a Mountain Home managed to meet and often exceed our own lofty standards for fun times and great memories. As you can see from the photos from our trip (link provided below) it was a superb time filled with unique experiences and adventures. Our base of operations at the Buffalo River Lodge provided our group with exclusive access to the resort and all of its amenities, located ~14 miles south of Yellville, AR smack in the middle of a plethora of great mountain motoring roads and just a stone’s throw from the scenic Buffalo River. The proximity to the river allowed several folk in our group to take advantage of the Lodge offering of an amazing Friday kayak trip (with beautiful, clear, cool waters and current sufficient to result in two capsizings (Cindy C. and Peggy J., both documented on Steve B.‘s GoPro) and participation in an ad hoc rescue of a stranded canoe and rounding up their lost belongings, complete with Steve B. pearl-diving to the river bottom to recover a sunken treasure. Except for Cindy’s lost shoe and sunglasses, none were the worse for wear.) The remainder of the group (the “dry” ones) enjoyed some thrilling motoring through the rocky bluffs to the south and west, with a nice lunch stop in Clinton, AR. The end of the day Friday was much like Thursday and Saturday — encamped around the fire pit on the grounds, taking on food and beverage, and having a fun time sharing all of our experiences from the day’s activities. Saturday’s drive headed east through the Buffalo National River area south of Mountain Home, AR with an unexpected but fun entry in the Pioneer Days Parade in Norfolk, AR (We just happened to arrive at the right time and hooked up at the tail end of the parade. Most of the locals thought our ad hoc entry was pretty cool!). That was followed by a trip over the historic swinging bridge (!) in Allison, AR; lunch at a neat local BBQ joint just north of Mountain View, AR, and then some spirited motoring back to the northwest to a mid-afternoon refreshment stop at Gravity BrewWorks, a thriving craft brewery seemingly in the middle of nowhere. The warm temperatures supported a swim call at the river after our return, followed by a cookout at the Lodge, more time around the fire pit, and disbelief that we had to head home the following day. Our thanks to all of the participating EIMers who made this such a fun and memorable event! The Central Iowa British and European Auto Fest happens next in Des Moines on Sunday, June 3rd. See the Event Calendar for the entry form. We’ll also be announcing soon a local lunch gathering for our MINIs that will happen later in June. Hope to see you there!